There are two types of things: Some items are easily and readily identified for exactly what they are by everyone. Then there are those things that are created and used by one group of people, but are a mystery to everyone else. The subject of this post is one of the second sort of thing. If the viewer belongs to either the Orthodox Christian or the Greek Catholic (Byzantine) church, he/she will immediately know what the object illustrated is (or is used for). Everyone else will probably make a guess about it, but will probably be incorrect in that guess. I'm neither Orthodox Christian or Greek Catholic. So when I saw this item in an antique shop recently, I thought it was either a butter press or a printing block used to apply a pseudo-stencil onto a wall. The antique dealer had no idea what it was. I didn't really care what it was; I just wanted it because it looked interesting and old. 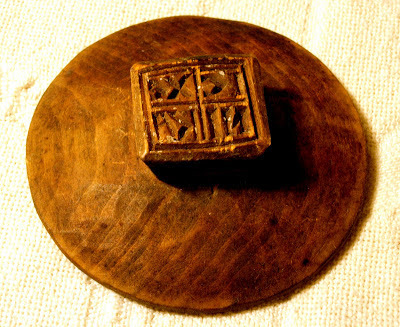 If I had been either Orthodox Christian or Greek Catholic, I would have known that this object was actually a bread press used to press a design into dough ~ similar to how a butter press is used. A leavened bread, known as a prosphora when stamped with this press, was used in the Divine Liturgy (Eucharist). The dough, made from wheat flour, water and salt, is unique in that the ingredients are mixed together and then set aside for a week to evolve into a sourdough ball from which its own yeast can be derived. The sourdough ball is crumbled into a bowl of water, and in time it starts to bubble as the natural yeast brews. More flour is added, and the resulting dough is kneaded by hand until all the air is forced out. Two-thirds of the dough is formed into a large, round patty and the remaining one-third is formed into a smaller, round patty. The small patty is stacked on top of the large patty (their matching surfaces having been brushed with water so that they'd stick together), and then the press, which will have been dusted with a bit of flour, is positioned on top of the stack. The press would be pushed down into the dough, compressing the small patty almost completely into the large patty. The press, stuck in the dough, is left for three or four minutes, allowing it to be loosened and more easily extracted. The dough is then heated to complete the bread-making process. The design inscribed on the press that I own is the same as the design on all other prosphora presses. It includes a cross comprised of five squares. The central square is referred to as the Lamb. It is divided into four smaller squares which hold Greek letters IC XC NIKA, which translates as "Jesus Christ conquers." 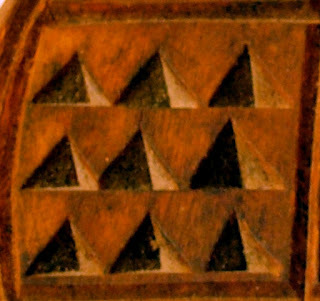 The squares above and below the central square, are copies of the central square. The square to the right of the central square contains nine triangle shapes in three rows of three, called the Nine Ranks. The square to the left of the central square, called the Panagia, is a representation of the Virgin Mary. 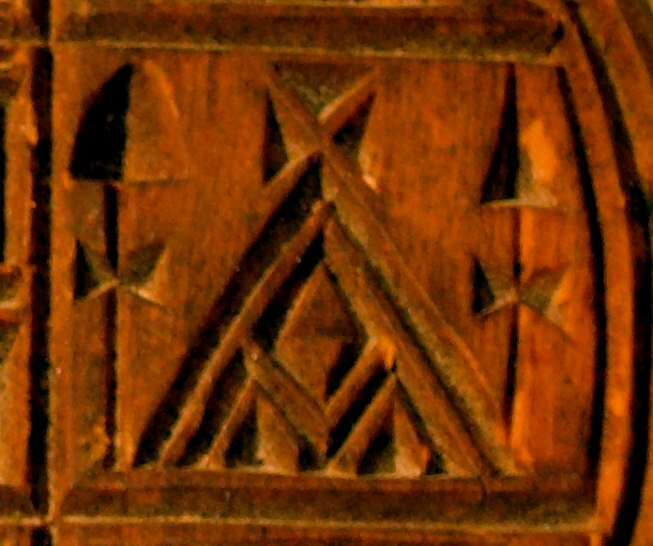 The handle, on the backside of the press, is a copy of the central square, or Lamb. 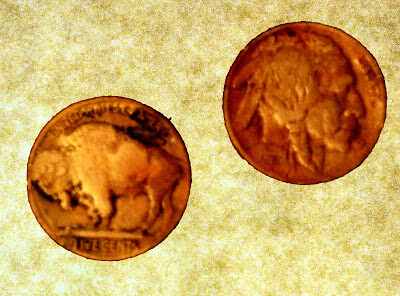 The photo shows two slightly worn "Indian head", or "buffalo" nickles. These two piece of U.S. currency date from 1917 and 1923, and apparently from the smoothed features, they were used quite a bit during their lifetimes. These, so-called, Indian head nickles are relatively inexpensive by modern-day numismatic standards. They were minted between 1913 and 1938. And, because the images have become smoothed over quite a bit, the mint marks are not readable. The 1917 nickle, having been circulated, would be worth between $4.10 and $50.00. The 1923, being a bit more common, would fetch between $4.00 and $40.00. I have no interest, though, in trying to get a fortune out of these two pieces of 75% copper and 25% nickel. I have no interest in the coins' numismatic value because their value lies in the job they fulfilled during their lifetimes. Yes, these coins performed a duty that most coins cannot aspire to. These two small, round pieces of copper/nickel metal paid for my great-grandfather's soul to pass into Heaven. Prior to the 1900s, people were superstitious in a world that was just beginning to have its secrets explained by science. 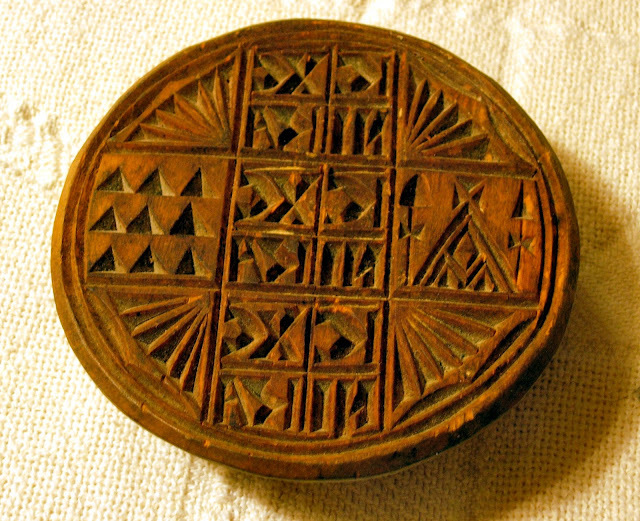 Various superstitions involved death and the dead body, two of which are here noted because they have to do with coins. The first of them was that if the eyes of a dead person opened during the 'wake', the first person on whom the eyes glanced would be doomed to death soon. In other words, the belief was that the dead person would be looking for someone to accompany them to Heaven. To avoid such a fate from happening, the deceased one's surviving relatives would place something over the eyes to keep them shut. Most often that something was a coin. The second superstition regarding coins and the dead recalled a belief held long ago by the Greeks. The Greeks and their cultural descendants believed that the souls of the dead traveled to Hades, the underworld. And to get there, the soul had to cross over the river Styx. The only way to safely get across the river Styx was by riding a ferry boat operated by the ferryman, Charon. And the only way that Charon would allow the soul to board his ferry boat was to pay him with a couple coins. For that reason, when a person died, a coin or two were placed inside the dead person's mouth to ensure that their soul would have the required payment for Charon. Much later, perhaps in the Sixteenth or Seventeenth Centuries, the practice of placing the coins on the dead person's eyes was found to, as it were, 'kill two birds with one stone'. The coins were there to pay the ferryman, and the eyes could be kept from opening. The practice of placing coins either in the mouth or over the eyes of a dead person continued to be popular in the Western World and among Christians up to the 1900s. And in some places, such as in the Appalachians, where German and Ulster Scot families resided for generations, the practice continued even into the 20th Century. And that is where we come to the death of my great-grandfather, Aaron Bowser. He died in 1945 in the region of Blair County, Pennsylvania known as Smith Corner. Aaron and his wife Linnie spoke German in private, and a form of 'dutchified English' in public. Their family was neither well-to-do nor dirt-poor. Their habits and customs were those handed down from their Eighteenth Century immigrant ancestors. And so, when Aaron died in 1945, these two buffalo nickles were placed over his eyes out of habit and custom. But new superstitious beliefs must have induced a family member to remove the coins from Aaron's eyes before his casket was consigned to the grave. For the past five days I have had the pleasure of hosting a common cold. I am a bit saddened, though by the realization that my new friend's visit is almost half over already. As they say ~ "Time flies, when you're having fun!" 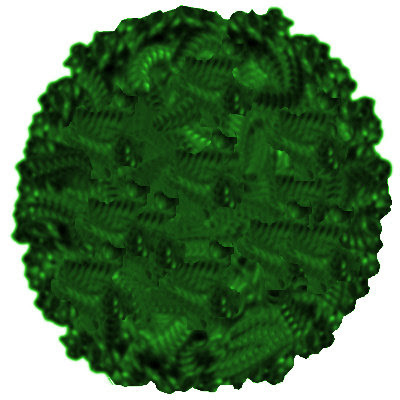 Anyways, the reason for creating this post was to note the history of the name: common cold. The State Papers of Henry VIII notes, in the year 1537, that: If I take any cold, incontinent the lax commythe agayne. In 1679 it was reported: His Majesty... has been indisposed for some days by a Cold he took. The word cold, combined with the word common, meaning "shared between two or more", became popular in the 1500s, apparently the result of a comparison of its symptoms with those of exposure to cold weather. Prior to an understanding of the science behind things, and when the cause of this disease was a mystery to all, it was noticed that it became more prevalent during cold weather. While we today have many medicines that purport to alleviate the symptoms of the common cold, there exists not any one single cure for the common cold. During the Colonial Period of the United States of America, certain herbs were known to help relieve the irritating symptoms of the common cold. Hyssop, a member of the mint family, was known to ease respiratory irritations if taken as a tissane (what most people call tea). Horehound and Marshmallow, being high in mucilage worked similarly to hyssop. Infusions (in which the water-soluble substances are extracted from plants by soaking in water) of yarrow, elder and peppermint; of bayberry and ginger; and of boneset, elder, yarrow and ginger were old 'cures' for colds. Coughs might be relieved by a decoction (where the essential oils of a plant are obtained by boiling the plant) of elecampane, white horehound, coltsfoot and fennel. Sore throats were soothed by an infusion of Goldenseal, Thyme, Sage and Myrrh. The 'herbal' treatment that I plan to use this evening is that concoction used by my Scottish ancestors ~ a hot toddy (one teaspoon of sugar, one teaspoon of honey, a shot of delicious Scotch whisky and boiled water).